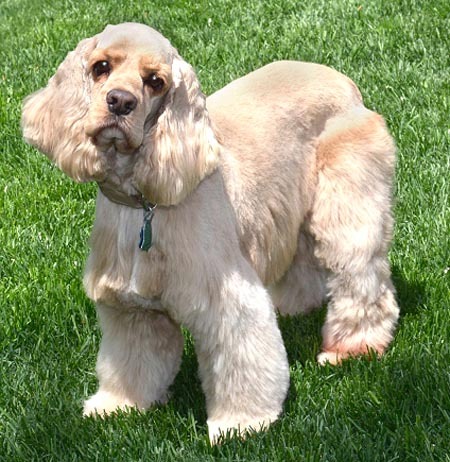 Caleb [Adopted June 2016] is a 6 year old, buff, male cocker, who came into rescue from a commercial breeder. Initially, he was very timid and afraid, but with the guidance of our 3 dogs and his familiarity with us, he has become quite a friendly, sweet dog. Caleb enjoys following a routine, and, at this point, is quite good at anticipating what he is to do next. In the time that he has been at our home, we have not seen any aggressive behavior - just a very sweet dog who loves to be with other dogs and humans. Caleb is crate trained and is in the crate when we are gone as well as at night (as are our dogs). He understands the concept of house training, and as long as he is let out every few hours or is in a crate, he can be considered house trained. He does not let us know that he has to go out, though if watched, he is starting to show us when he needs to go out. Caleb loves to go on walks and walks quite well on a leash. He loves to be brushed as well. Because he is timid in new situations, and he is quite dependent on having an example to follow, he would need to go to a forever home that already has a dog.